Sometimes, Doctor Who is slightly dark. Sometimes that darkness is offset by black humour. Other times it's not, and it's just plain bleak. This is one of those times. 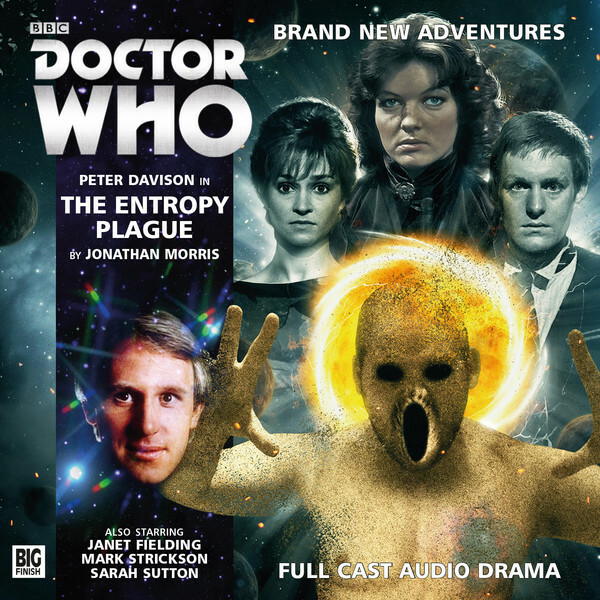 The Entropy Plague wraps up both Big Finish's new E-Space Trilogy, and the story of the older Nyssa. Rather than picking straight up from Equilibrium's cliffhanger, it does something different. It opens with the Doctor sombrely visiting Nyssa's son Adric to deliver some bad news, and the story unfolds in flashback, with all four members of the TARDIS crew 'narrating' in turn. We know right from the off that something has gone terribly wrong, and that Nyssa isn't coming back. The TARDIS crew, in pursuit of the kidnapped Tegan, arrives on Apollyon, a world that knows it is dying, a world with no power, wracked with entropy - patrolled by steam-powered robots and menaced by horrifying 'Sandmen'. Here, fruit rots within minutes, and desperate citizens offer themselves up as 'tributes' to amoral scientist Pallister (Robert Duncan) in an attempt to get off-world. Pallister guards a portal - a way out of the CVE and back into N-Space, but it's powered by human life-force. The tributes are quite literally sacrifices, procured for Pallister by a group of space pirates led by one Captain Branarack. The pirates are quite cartoonish, with their broad West Country accents and constant leering they just don't quite sit right with the rest of the story - which is so bleak that they don't even provide any form of light relief. The sneaky Pallister, on the other hand, is excellently played by Duncan. There's not a lot to him as a villain apart from standard-issue amorality and self-preservation, but Duncan runs with it and makes him compelling. Catherine Skinner also does well as the plucky Cherryanne. The episodic flashback format is unusual, but works pretty well. Ken Bentley does a fine job of directing as always, and the sound design is superb with its hissing Sandmen and steam-driven Sentinels. Writer Jonathan Morris really excels on two fronts. The first is a fine bit of world-building - vividly binding together not only themes from the rest of the trilogy but nods to Warriors Gate, The Keeper of Traken, and Logopolis, with a soupcon of the mexican day of the dead thrown in against a backdrop of dying stars. The second is in some fine material for both the Doctor and Nyssa, with the former starting off on rattling form - charming and cunning, until he realises how hopeless their situation is, and attempts to sacrifice himself by staying behind in E-Space. Peter Davison makes this all sound effortless, his Doctor is lining himself up here to do basically the same as his much older self will one day volunteer for on Trenzalore, he sells it well with a tiny hint of regret, and a sense of responsibility for dragging everyone into this. Meanwhile, Sarah Sutton quietly steals the show - as wise, gentle Nyssa calmly and gracefully steps into the breach to save E-Space, at the expense of her freedom, leaving her friends and family bereft. This looks to be her final bow, her final speech is beautifully written and tear-jerking. Although it ends with a slight note of hope, this looks like more of a full stop than a comma. Nyssa has had more character development on audio than she ever did on TV, and her character has really grown. Tegan and Turlough slightly fall by the wayside for parts of the story due to various collapses and captures, but have valuable contributions to make, with Tegan the angry voice of humanity and reason, while Turlough's trademark selfish nature twists well into upset frustration when his friends try to sacrifice themselves. It's a nice added dimension to his character, and it really adds to the story. Knowing Big Finish, this might not necessarily be goodbye for Nyssa, but if it is, it's a beautiful, sad send-off for an underrated companion - one of the Doctor's best friends. The Entropy Plague isn't always an easy ride, but goodbyes aren't always easy. Mysteries and paranormal events are unleashed in this new arc for the current TARDIS crew. With a rather brutal enemy overcome, the way is open for the Doctor to grapple with a rather more elusive entity which has some pretty radical methods for achieving its goal. A goal whose exact nature remains to be seen. With Coal Hill School once again in the foreground for the confrontations to come, as well as the presence of old allies ' UNIT', there is an element of 'been there, done that'. But will something nasty rear its head? This story is as complex in its own way as 'Swords of Kali', but reads in a more immediately accessible way that is also less demanding of the general reader. It remains to be seen if the concluding sections work as well as the set up that is presented here. Rather interestingly we join the Doctor and Clara as they contend with a very large but also rather stupid adversary who barely makes the duo break sweat in achieving victory. In the process the Judoon (one of the RTD era's best creations) get a name check but don't manage to actually appear. The adventure proper for the duo then begins, although relevant events have already been presented to the reader in the story's initial pages which certainly set a mysterious and unpredictable tone. This story notably picks up quite a while after issue 5's conclusion as Danny Pink has gone to the great place in the sky - both literally and metaphorically - following TV Series 8's finale. Clara at this point in her life is truly enjoying her travels with the Scottish-accented Gallifreyan. Yet she wants another spell at the comfortable (by comparison) day job of teaching. Before the wish can be granted, they must both respond to a problem at UNIT where a reality gate has run amok. Paul Foster, who happens to be the late father of one of Clara's pupils, was killed in a car accident, but had been working on the projects with the gate; scientific work that the Doctor is very critical of as he once again meets Kate Stewart. By having key Who settings and supporting players recur, this is really the first in this Twelfth Doctor range to reflect the general make-up of the TV series featuring the current Doctor and his companion. Writer Robbie Morrison continues to impress me following his earlier work in the preceding set of issues. He is a great portrayer of individuals who have a certain identity and powerful emotions that flow from the trials and tribulations of their life choices. The key theme of loss and family ties is well conveyed and gives some weight to what could have potentially been a mere romp, - 'Swords' already set a standard for a lot of moving players but also telling more than just a plot heavy narrative. Hopefully Morrison maintains this quality for a good while yet. Also welcome is some respite from the more outlandish settings and multiple time zones with the threat being focused on contemporary Earth, barring that rarely used practice of having a finale to a mostly un-told story. I would rate, Brian Williamson, as a competent artist for the line, maybe favouring a rather literal style, with little of the quirks or artistic licence of some other contributors to other Doctor Who titles of late. Perhaps less commendable is the choice of limited colour -- the story jumps around more than enough here but the colours don't quite match this diversity. Nonetheless any weaknesses almost get eliminated by the end as the actual cliffhanger with the major villains revealed is striking and memorable. At the very least I hope for this story to match 'TerrorFormer's quality on the basis of the potential so far displayed, if 'Swords of Kali's level would prove a step too far. "Sewer Monster" has a clever use of the Doctor and Clara in conversation but only one of them actually appearing. Yet another creature from the RTD era is brought back by writer/artist AJ, but perhaps not necessarily the most fearsome one, despite the piece's title. "The Partying of the Ways" is also nostalgic, whilst managing to be very strong in its principal role as a comedic mini-story. It again shows the fruits of the Colin Bell/ Neil Slorance partnership. Clara's relationship with her centuries old friend is explored to an extent, whilst also organically growing out of the somewhat chaotic scenario they find themselves in. Gallifrey was originally conceived by long-time Big Finish and Doctor Who alumnus Gary Russell as BF’s answer to The West Wing, combining the power plays and politicking of Gallifrey’s inner halls of power with extraterrestrial and temporal threats from beyond the Time Lord capital. The mainstays of the series – Romana, Leela and Co-ordinator Narvin (Seán Carlsen), head of the Celestial Intervention Agency (CIA) – began as bitter rivals before remarkably becoming close allies. Unlike its parent program Doctor Who, Gallifrey’s first 24 chapters across six series were generally complete stories of roughly one hour’s duration each, with numerous story arcs flowing over into subsequent episodes, and for the most part set on Gallifrey (or in later boxsets, variations of the Time Lords’ home world). The latest instalment of Gallifrey is a departure from the norm in several ways. Intervention Earth is a single story which eschews the one-hour format for a structure more like a classic Doctor Who four-parter (each episode of 30 minutes duration). The overall serial is also intended to be broader and faster-paced, focusing on a conspiracy that is not only confined to Gallifrey but which (as the title obviously implies) encompasses Earth as well. Indeed producer, director and writer Scott Handcock in early publicity for this title described it as “Time Lords meets 24”, an evolution on the Time Lords/West Wing analogy, although that is really an exaggeration. The pace of this serial is very, very different from the urgency and tension of 24. In fact, it strays little from Russell’s original concept. Of the veterans of earlier series, only Carlsen reprises the role of Narvin. President Romana is also back but in this story the role is not portrayed by veteran Lalla Ward. Instead, the honour falls to former Buffy the Vampire Slayer alumnus Juliet Landau, who portrayed the Time Lady’s third incarnation in Gallifrey VI as well as the Doctor Who Companion Chronicle Luna Romana. Landau portrays a regenerated Romana sometime after the events of Gallifrey VI, when she is in the last term of her presidency. Leela’s role in this drama is ably filled by the Seventh Doctor’s long-running companion Ace (Sophie Aldred). Now a CIA agent, Ace is equipped with her own TARDIS (with functioning chameleon circuit!) but her bolshiness has definitely not been tempered by life and education on the Time Lord home world. It is hard to judge exactly how good this new “team” is to the “trio” of Gallifrey’s first six series. This is mainly because they are split up across the four episodes and do not unite until the climactic episode. Indeed, each of the four episodes focuses on key characters. Ace is primarily the focus of part one as she is reluctantly paired with Rexx (Gyles Brandreth), an agent of the Time Lord High Council, on a mission to Earth (“Oh no, no, no, I don’t do companions!” Ace protests, much to the listener’s amusement). In part two, the limelight is shifted to Romana’s presidential aide Lukas (Scott Arthur) as he uncovers an age-old conspiracy on Gallifrey (long-time listeners of the Gallifrey saga will recognise that Arthur played an alternate version of Lukas in Gallifrey V and VI). Part three sees Narvin journey to Stone Age Earth to recover Ace and uncover a cult with links to the conspiracy occurring on Gallifrey. In the process, Narvin becomes aligned with huntress Sol (Rachel Atkins) and boatman Min (Toby Longworth). Considering he ought to have gained a better understanding of primitives from his adventures with Leela, it is amusing to hear that Narvin is equally out of his depth with Sol and Min! The gang comes together in the last episode as Romana takes charge and she and Lukas are reunited with Narvin and Ace in a confrontation with an ancient Time Lord foe whose machinations threaten the universe itself. Until this point, Juliet Landau’s portrayal of Romana is rather dull and underwhelming, restricted to the character’s presidential duties and diplomacy. Indeed, whether it is down simply to Handcock and Llewellyn’s dialogue or simply that this version of Romana is meant to be more cautious than her previous selves, Landau’s performance is at times almost monotonous. There is certainly none of the humour and mischief that she exhibited as Romana III in banter with Romana II in Gallifrey VI or indeed the naivety and haughtiness she displayed in relating Romana I’s story in Luna Romana. It is a surprisingly flat portrayal. It is only when faced with the serial’s antagonist that President Romana (and Landau herself) really rises to the moment. If you’re still uncertain who or what the menace of Intervention Earth is, then read no further. However, if you’ve spied the cover artwork for the release, then the helmeted figure in chainmail armour and flowing robes will be unmistakably familiar to 99.9 per cent of long-time Doctor Who fans and BF listeners. The villainous Time Lord pioneer Omega only made two appearances in Doctor Who on television but left an indelible mark on the mythology of the TV series. From the picture book K9 and the Time Trap in 1980 (which called him Omegon!) to children’s and adult novels (Search for the Doctor, The Infinity Doctors), and from comic strips to Big Finish’s own audio range, which released the self-titled Omega in 2003, the character’s life outside the TV series is as seemingly infinite as his ego. Despite the masterstroke casting of the original actor Stephen Thorne (who is himself a Doctor Who monster alumnus, dating back to 1971), Omega’s involvement in this story is less overt than expected. Considering what a magnificent voice Thorne has for Omega (his commanding voice reminds you why in The Three Doctors it was so pivotal to an entity whose will was all that remained of his being), it is disappointing that his encore performance is so limited and wasted. However, as you discover in the closing moments of the serial, Omega’s role in the plot has been subtly and cleverly all-pervading – and we haven’t seen the last of him ... Whether we will hear Thorne’s booming and authoritative tones again, though ... I guess watch BF’s space. At the very least, Thorne deserves another opportunity to shine. The conclusion to Intervention Earth is open-ended and the listener is literally left hanging. With the serial’s chief antagonist on the loose, the serial ends on another twist, as another familiar figure (missing since the events of Gallifrey IV) makes a surprise entrance. Whether this figure’s return is a blessing or a curse remains to be seen. What is also not equally clear is whether the next instalment – Gallifrey: Enemy Lines – will address some of the ramifications of Intervention Earth. With further details scarce at the time of writing, Enemy Lines appears to predate Intervention Earth, as Lalla Ward and Louise Jameson will reprise their roles as Romana II and Leela, supported by Narvin and Ace. Of course, perhaps there may be a link – or the cliffhanger to Intervention Earth will be resolved in an entirely different serial at a later date. If you overlook Handcock’s imprecise comparison to 24, Gallifrey: Intervention Earth maintains the high production values, artiste performances and scripting of its predecessors in the Gallifrey series. While the “regenerated” format and structure are hardly revolutionary, and the decision to set the story later in Romana’s life and presidency is not as intriguing or refreshing as it initially seemed in all the pre-release publicity, there are still signs that the Gallifrey saga is heading in the right direction and that there may still be some interesting twists in future releases. The release of the box set Missing Persons in December 2013 seemed to bring the long-running audio adventures of former Virgin New Adventures companion Professor Bernice Summerfield to something of a conclusion, albeit a not entirely satisfying one for this listener. However this new boxset of four episodes which each dovetail neatly to form a very satisfying overall arc is very much a start of a new phase for Bernice or Benny as she prefers her friends to call her. Unlike the previous range of Boxsets which still carried a large amount of continuity baggage which Benny had accumulated over the course of the previous decade of audios, this set has dumped the other regular characters and presents us simply with an older version of Bernice who we are occasionally reminded has a family and friends. Unlike 2011’s Epoch, this really can be recommended as an ideal jumping on point for anyone who hasn’t heard any of the previous audio adventures. This set also sees her reunited with the Seventh Doctor and Ace with whom she travelled in the Virgin New Adventures novels two decades ago. However, it is Bernice who is the main protagonist throughout this box set with her erstwhile companions only making their presence felt at key intervals. Kudos then is due to Lisa Bowerman, who has been playing Benny on audio for 16 years now for making her such a continued joy to listen to. The set opens with The Revolution by Nev Fountain. This is very much a comedic piece in the mould of some of the more whimsical of Benny’s past adventures opening with her getting drunk in a bar on the planet Arviem 2. The introduction into the preceedings of Sylvester McCoy’s Doctor, who has apparently lost track of both his TARDIS and mind leads to a number of comic mishaps which may grate a little on first hearing. Fountain later observes in the CD extras that even the Doctor has the capability to just be an annoying man in a hat sometimes although those who are not fans of McCoy’s more season 24-esque performances are duly warned to expect occasional over the top silliness. However the conclusion to the story seems to justify the means to which it is arrived at and so Benny is duly dispatched to search for Ace. Goodnight Sweet Ladies by Una McCormack is possibly the highlight of this whole boxset. Pitching Benny into a situation where she ought to be at home and yet the reality of what’s really going on reminds just out of sight until it’s too late. The two guest stars for this story add to the atmosphere. John Finnemore is a genuinely likeable if somewhat useless companion but just as she has done on TV as Clara Oswald’s Gran, Sheila Reid steals every scene she’s in as the mysterious Claire whose role is central to this story. Next up is Random Ghosts by Guy Adams. This changes the pace quite dramatically as Benny is reunited with Ace on the Forbidden World where time is not running correctly. The device of events jumping around in time is not a new one for audio plays but it certainly seems some time since Big Finish last produced a play that did so this memorably (The examples of 2003’s Creatures of Beauty and 2004’s The Natural History of Fear come to mind). Some listeners may find the continual jump cuts between scenes and varying outcomes of conversations slightly hard work but the conclusion is a worthwhile one and despite seeming obvious given the clues we’ve had previously still manages to seem surprising at the same time. The set concludes with The Lights of Skaro by James Goss. Whilst this set has been very much centred on Benny, this final story pitches her firmly back into the world of Doctor Who with Daleks around every corner and even a fleeting cameo from Davros. There are some clever revelations and if you’ve survived some of the topsy-turvier moments of the first three stories you’ll be well rewarded in this finale. Possibly the best thing about this set is that is has allowed some fresh storytelling from writers who are not regulars at the Big Finish stable. It is to be hoped that this new phase of Benny’s return to the worlds of Doctor Who will continue for the foreseeable future under new range producer James Goss (whose track record includes having produced some great audios for the BBC Doctor Who and Torchwood ranges). This listener is very much looking forward to The New Adventures of Bernice Summerfield Volume 2: The Triumph of Sutekh. Starring: Paul McGann (The Doctor), Nicola Walker (Liv Chenka), Ruth Bradley (Molly O’Sullivan), Alex Macqueen (The Master), Natalie Burt (Dr Sally Armstrong), David Sibley (Professor Schriver and The Eminence), and Sean Carlsen (Narvin). The third boxset in the Dark Eyes series is something of a departure from the first two releases. Rather surprisingly Nick Briggs has taken a back seat from being involved in this release and some fans may have been relieved that the four episodes of Dark Eyes 3 are a Dalek-free zone. Instead, these episodes focus instead on the mysterious origins of the Eminence and its Fifty Year War against humanity plus a goodly helping of Alex Macqueen’s delightfully camp yet utterly sinister incarnation of the Master. In Briggs’ absence, all four episodes are written by Big Finish stalwart Matt Fitton and whilst there may not always be the same flair of originality which made the first Dark Eyes such as success this is a consistently solid sequence of stories which sows together various elements neatly in preparation for the fourth and final instalment of the saga. The opening episode, The Death of Hope, picks up fairly directly from the cliffhanger coda to Dark Eyes 2 which saw Molly abruptly kidnapped by the Master and his accomplice Dr Sally Armstrong. The Doctor’s quest to save his companion finds him united with the Coordinator Narvin of the Celestial Intervention Agency. Sean Carlsen reprises this character who has previously only appeared in the spin-off series Gallifrey and it is fun to hear a character who has been at times both an enemy and an ally to Romana and Leela finally cross paths with the Doctor. This story makes clever use of the narrative device of the Doctor and Narvin witnessing a matrix projection of the Master’s activities, in which he appears to be offering salvation to a planet under threat of invasion by the Eminence. It certainly gives Alex Macqueen’s Master and Natalie Burt as Dr Armstrong a chance to shine as the main protagonists for this episode. The second episode pitches the Doctor and his newest companion, Nicola Walker as Liv Chenka firmly back into the action on the planet Ramossa where tensions are rife between human colonists and the indigenous insect-like Ramossans. Particularly notable is an unrecognisable Sacha Dhawan (An Adventure in Space and Time) as Ramossan General Jaldam. The final scenes feature Paul McGann’s Doctor at his best. Believing himself to have been outmanoeuvred by both the Master and the Time Lords and learning with some dismay of his companion Liv’s terminal illness, the Doctor resolves to take drastic action. Masterplan finally delivers on the promise of this boxset’s unofficial subtitle “Doctor vs Master” as the two Time Lords finally come face to face in a scenario where they are given some enjoyable verbal sparring which will call to mind their future encounters in the TV series guises of Tennant and Simm. Meanwhile, Liv is working under-cover as a research assistant to Professor Markus Schriver, the mentally unstable scientist destined to create the Eminence (nicely played with a lighter contrast to his sinister Eminence voice by David Sibley). Here she is confronted by the Master’s companion Sally Armstrong in a nice mirroring of the stories main confrontation between the Doctor and the Master. Considering Sally was originally a potential companion to the Doctor in Dark Eyes, the outcome of this story will be disappointing to some listeners. The boxset concludes with a suitably large-scale finale. The Rule of the Eminence sees the Master attempt to take control of the human race using the Eminence’s controlling gas combined with Molly’s progenitor particles. Whilst this story is reminiscent of Last of the Time Lords, it does have enough originality to stand on its own. Having only appeared peripherally in the first three episodes, it is a joy to hear Ruth Bradley as Molly, playing such a central role in the action. Knowing that there is a further final Dark Eyes box set to follow, Molly’s apparent exit in this story is a surprise but it seems Big Finish made good plot expediency of Ruth Bradley’s limited availability for recording in what has proved to be her final audio appearance. This listener is a fan of the character of Liv Chenka, so her continuing as a regular companion into Dark Eyes 4 and the forthcoming Doom Coalition series is welcome. However the magical cure bestowed on her in this story to enable this to happen was rather convenient and could have warranted further development. Overall, this is a worthy conclusion to this boxset which makes particularly good use of the Macqueen incarnation of the Master (who sadly only features in one of the four episodes of Dark Eyes 4). Hopefully Macqueen’s Master will be have another chance to spar against the Doctor in the not too distant future. It seems a fitting addendum to mention that the fifth CD in this set, featuring the usual round of interviews with members of the cast and crew, reminds listeners that this set of stories was recorded in the immediate aftermath of the untimely death of Paul Spragg in May 2014. Paul was a much loved member of the Big Finish production staff who worked on numerous releases across many audio ranges over the preceding five years. He continues to be missed both by those who had the pleasure of working with him and by many fans who either met him or just heard him on Big Finish podcasts and extras. This set features well-deserved and at times deeply poignant tributes to him, led by actors Paul McGann and Nicola Walker.